In the performance automotive world, the well-known B&M shifter is a high-quality, bolt-in replacement shifter for street or race cars. The design is centered around a shorter shift throw for quick and precise shifts on just about any manual transmission. The XDR UTV gated shifter features B&M’s finger-trigger-operated lockout gate and fills a unique need in UTV driving. The XDR gated shifter features a CNC-cut Magnum shift handle with replaceable Magnum side-grip plates for even further customization options. B&M Racing’s infamous gated shifter’s reliability is also backed by a million-mile warranty. Billet-aluminum construction eliminates flex, and the Magnum grips add another customizing choice. The B&M Racing XDR gated shifter is made almost entirely from CNC-cut billet aluminum. The gate plate and pull trigger are made from incredibly strong stainless steel, and so are the pins and hardware. Our ’14–’18 RZR model included a new rubber console shift boot, and it used the stock Polaris bushings from the OEM shifter. Installation is pretty simple. The instruction sheet lays everything out with good photos and a description. You remove the seats, center cupholder/console and the stock shifter. Swap the bushings and install the XDR model. The one thing overlooked or not mentioned is that you have to drill a hole in the stock shifter mounting bracket to bolt up the new shift gate. It will require a little cable adjustment, and we also tweaked the shift cable mount a little to better line up with the new shifter connection location. The XDR shifter we mounted fits the 2014–2018 Polaris RZR XP 1000, XP 1000 4, XP Turbo, XP Turbo 4, RS1, 900 S and 900 4. They also make one for the Can-Am Maverick X3 and an XDR short shifter for the manual-transmission Yamaha YXZ1000R. The XDR gated shifter works just as it should. The safety gate prevents an accidental shift. Once properly adjusted, it also gives you a positive, locked-in position for each gear with no guesswork. As for really improving the shifting, the B&M shifter eliminates the flex found in the mass-produced stock shifter, so it’s definitely more accurate and feels better, but we are dealing with a CVT machine that requires you to come to a complete stop before shifting between P/R/N/L/H, so you don’t actually use it as a quick shifter. Anyone who really appreciates the feel of truly quality parts will love this shifter. 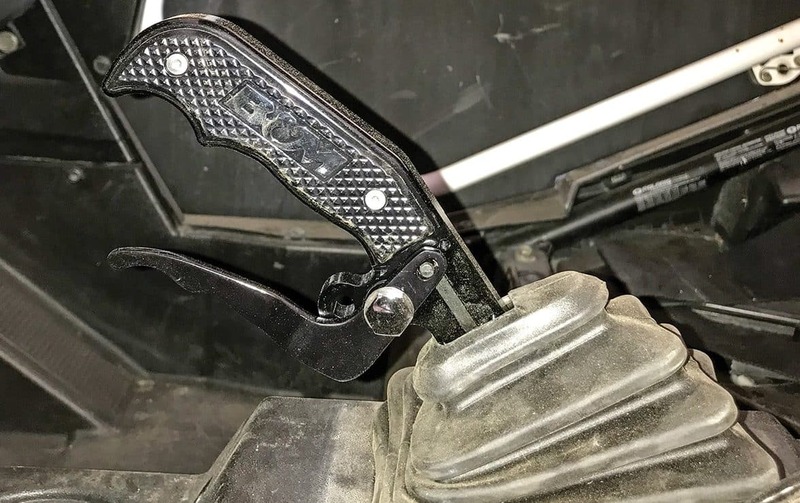 If you like to have the best of the best and have extra cash laying around, this shifter will make a great addition to a nicely accessorized machine. While we haven’t used the YXZ1000R model yet, the fact that it offers a shorter throw for the manual transmission will definitely add performance value in comparison to the CVT models. This would not be the first accessory we would add to our XP 1000, but that is not really the market anyway. If you like having the highest-quality, best-possible parts in your machine, you will be hard-pressed to find a flaw in the B&M shifter. As for the cool factor, it’s the real deal. Ours definitely spiced up the driver’s compartment, and we’re sure it will look good in plenty of race cars, as well as sand and adventure builds across the globe.